An interesting question came up in the last Google webmaster office hours, with Google’s John Mueller being asked about internal links, and how Google weights those links for SEO purpose. While one use for internal links is for users to enable them to easily find their way around a site, there is also a great deal of value in those links for SEO as well, especially for signalling to Google and other search engines which of your internal pages are more important than others. For example, would a footer link be weighted as high as one in the navigation? 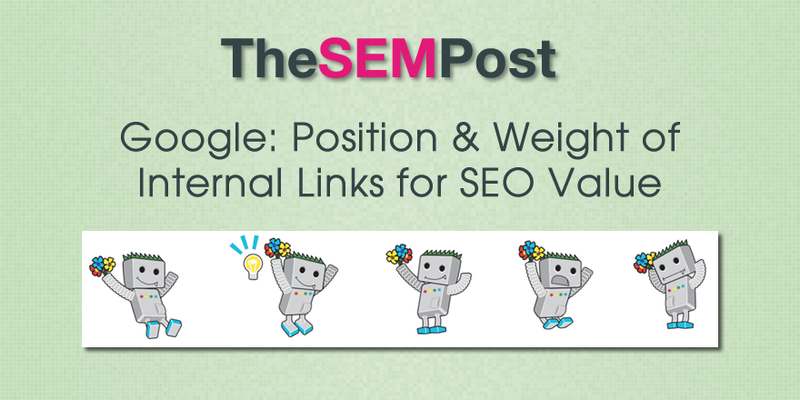 Or would there be more SEO value in an internal link placed higher on the page or HTML? So position on a page for internal links is pretty much irrelevant from our point of view. We crawl, we use these mostly for crawling within a website, for understanding the context of individual pages within a website. So if it is in the header or the footer or within the primary content, it’s totally more up to you than anything SEO wise that I would worry about. So looks like all those internal massive footer links we see on some sites might not be that bad for SEO, even if it does look pretty awful for users. That said, there definitely are sites that aren’t using the full value of their internal linking structure to ensure Google weights internal pages properly. While this isn’t as much of an issue on smaller sites, sites with a massive number of pages should consider their internal links for SEO purposes, including showing Google the importance of specific pages and for crawl budget purposes, regardless of where they end up getting placed on those pages.